Our local Melting Pot featured a special themed four course St. Patty's day feast in March including drink specials for $32 per person. Enjoy our Caramel Bailey’s Milk Chocolate or Dark Mint Chocolate Fondue, served with fresh fruit and an assortment of cakes. Irish Gold…$6.50 Jameson Whisky, ginger ale, Peach Schnapps, and orange juice. Emerald Isle…$6.50 Malibu Rum, Midori melon liquor, Amaretto, sweet & sour and pinapple juice. Bring the vegetable broth to a simmer in the fondue pot. Add the green goddess, smoked bacon, pepper, and garlic and wine seasoning to the broth. Stir until the ingredients are warm, just a few minutes. Next in a separate bowl mix the cheeses and flour. Finally, add the cheese and flour mixture a little at a time to the broth and stirring each time until the cheese is dissolved. Measure vegetable or canola oil to fill your fondue pots 1/2 full. Heat the oil in a saucepan on top of the stove until it reaches 375 degrees.Very hot, but not smoking or boiling. Test the oil by dunking a cube of bread. When bread sizzles immediately upon submersion you're ready. CAREFULLY pour the oil into a fondue pot on the table. Spear your choice of entree with a fondue fork and place in hot oil. Cook until it is done to your satisfaction. It cooks quickly, no more than a minute. Your cooking technique will improve with each dunking. Remove the meat from the fondue forks onto your plate. Serve with three or four sauces that go well with the meat. Served with tempura and sesame batters to dip the meat into before cooking. over a bed of greens with a drizzle of sweet balsamic glaze dressing. Combine the vinegar, sugar, shallots, garlic, Dijon mustard and pepper in a bowl and mix well. Add the oil slowly, whisking constantly until blended. Store the vinaigrette in a jar with a tight-fitting lid in the refrigerator for up to 3 weeks. 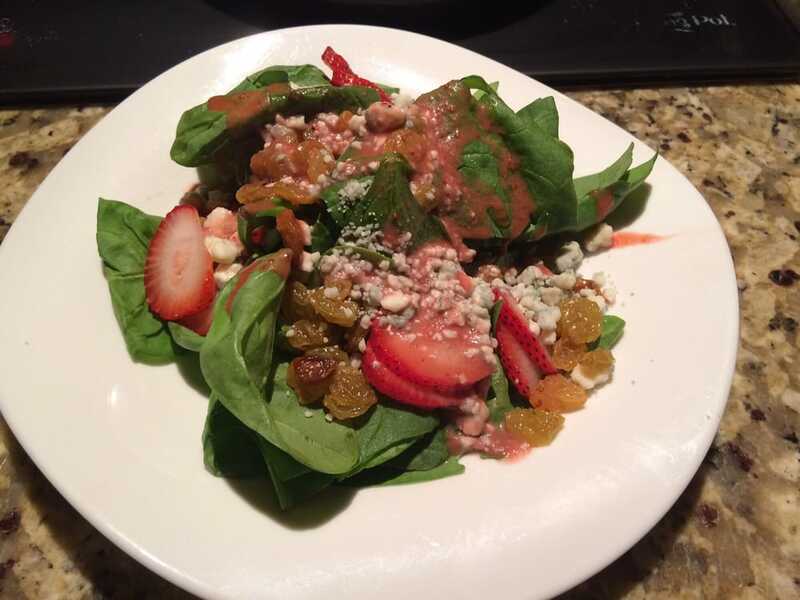 Gorgonzola cheese crumbles topped with a strawberry vinaigrette. Combine the jam, water, vinegar, walnut oil, salt and pepper in a bowl and mix well. Add the canola oil slowly, whisking constantly until blended. Store the vinaigrette in a jar with a tight-fitting lid in the refrigerator for up to 3 weeks. Preheat oven to 350. Place the almonds in a bowl. Warm the honey just so it liquefies and pour it over the almonds. Mix well so that all the almonds are covered well. Spread the almond and honey mixture onto a parchment lined baking pan. Sprinkle sea salt over the top. Bake for around 15 to 25 minutes shaking the almonds every few minutes to prevent burning one side. Rub the inside of a heavy pot or dutch oven with the cut side of the garlic. Add the hot sauce and bring to a simmer over medium heat. In a bowl, toss the cheeses. Working in 3 batches, gradually stir the cheese mixture into the hot sauce until melted. Cook, stirring occasionally, until the mixture is gently bubbling, about 2 minutes; season. Serve immediately from the dutch oven or transfer to a fondue pot. Serve with chicken tenders and celery sticks. The Melting Pot is a fondue restaurant where you can go and have a fancy sit down dinner. The waiters make the different fondue courses in front of you and then you get to use the fondue forks to cook your own meats and veggies. There is a cheese fondue, salad, meat fondue, and then dessert fondue all very delicious. The restaurant is pricey, but they do use expensive ingredients to make the fondue. Get to know the Fondue Effect. 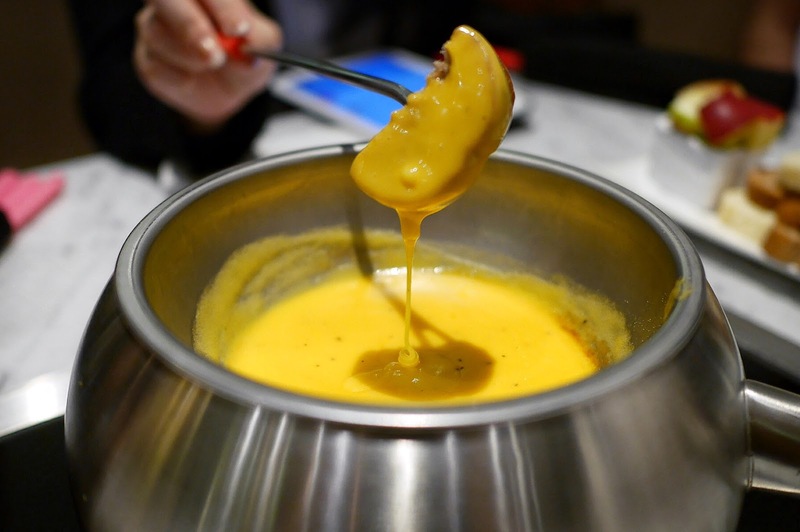 An introduction to The Melting Pot's fondue dining experience. Dippers, such as tortilla chips, cooked chicken chunks, toasted French bread cubes, and assorted vegetable chunks (sweet peppers, zucchini, yellow squash, broccoli, and cherry tomatoes) to complete your meal. In a medium saucepan cook chorizo over medium heat until browned. Drain all but 1 tablespoon fat. Add onion and cook for 5 to 7 minutes or until tender. Stir in chipotle peppers and garlic. Add beer; bring to a simmer. 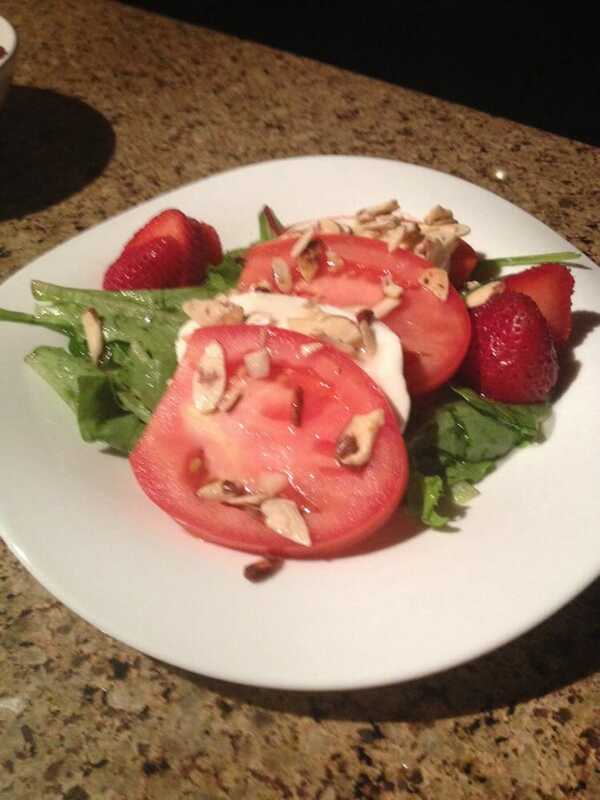 Notes: Use additional Monterey Jack or whole milk mozzarella if suitable Mexican cheese is not available. To toast bread cubes, place French bread cubes on a baking sheet. Bake in a 350 degree oven for 5 to 7 minutes or until crisp and toasted. Make the roux as stated above and then add the Dijon mustard, Worcestershire sauce, porter and cream. Take care to stir and not boil the sauce. 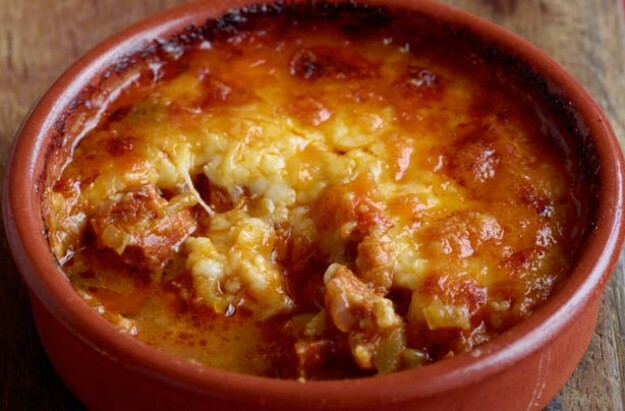 After all the liquid ingredients have been incorporated fully add the cheese in small chunks, whisking continually as to keep the sauce from boiling or breaking. Once the sauce has been incorporated taste and season with Tabasco, salt and pepper. Strain the sauce and hold in double boiler. Makes about 2 quarts. At the restaurant they serve this with garlic toast, andouille sausage and broccolini but anything will work. 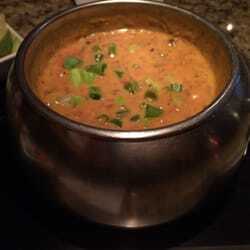 Copycat Recipes for items on the menu at The Melting Pot Restaurants and all things related to fondue.